Are you an email marketer? Are you a marketer looking to add email to your skill set? Do you think email marketing is a good way to grow your business? If you answered yes to any of the questions above, you probably have your own set of email marketing questions you want answered. 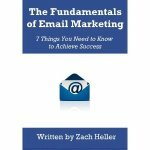 I quite literally wrote the book on email marketing. But it’s been a few years now, and as we all know, things change. Which is why I’m thrilled that Buffer released this blog post that provides detailed, data-driven answers to some of the most popular questions around email marketing. Whether you want to know when to send your emails, how to grow your list, or how to track the results, this post does a great job giving you the answers. Check out the full set of answers to common email marketing questions here.